Have sent you a reply.3 seats is fine. For anyone still looking we have seats available on a bus leaving from The Spice Lounge in Drumbrae at 10am and returning after the game..
Family friendly bus and no alcohol allowed. Do you have any availibilty left on bus at all ? Just a quick head up to all who are running and/or travelling on buses to Hampden on Saturday. There will be a very heavy police presence on the road through to Glasgow and a very, very high chance your bus will be stopped. Best to do the sensible things on Saturday which are either get on the bus and take no alcohol on with you or if you are unable to go for around 1 hour without alcohol intake anyway it might be better not to actually go to the game at all but make a medical appointment instead as it is a sign of a very serious health problem. Having a drink on the bus doesn't make you an alcoholic Ffs, why does it rile folk so much. Apologies to the both of you for passing on some information. In reality the post was intended for the likes of Gambo and more recently Willie Wallace, who are running buses, and will be the ones along with the drivers and their businesses who will incur any fines if a bus is stopped and alcohol is found. And the fines are far from small. The bit at the end, regards being unable to go for around 1 hour without having any alcohol, you can take how you want. Drinking on a bus doesn't make you an alcoholic, being unable to go for around an hour without having any alcohol during that period does in itself, potentially suggest a problem. But bash on. II would leave it there Portobellojambo1. You have indicated that there will be an increased police presence on route to Glasgow, giving other bus conveyors who don't normally arrange travel a heads up on potentially being stopped and searched for alcohol. I would expect a thank you, but others appear to want to make a thing about drinking on supporters buses. And an alcohol ban on said train might scupper your plans. Maybe you should go to your GP and get help for your drink problem.🍺. If folk were unaware buses may be searched then they haven't been to many big games. Im sure PJ1's intentions on that front were good. He made an issue of people drinking not the other way around. I say that as a teetotal person who will be using public transport on Saturday. It did in 1996 on return trip to Edinburgh a friend got cautioned by the police on the train and beer confiscated! "There will be extra staff on-hand to assist people on the trains, while alcohol bans will be in-place between Glasgow and Mount Florida/King's Park"
Correct it doesn't. The rule is there though, and if broken the driver and the likes of Gambo will be in trouble. Considering the drivers job is in jeopardy and the amount of time spent by Gambo and the other bus organisers think they could sack drinking for an hour so nobody gets into bother with the polis especially the West of Scotland ones. Portobello Jambo is only passing on some sound advice IMO. I can see he was passing on advice about buses but he also threw in a comment about seeking medical help so he invited a bit of stick. I'm sure he's a big enough boy to defend himself. He is a good poster and I barely drink myself, probably 2 beers in the last two months. Its the same arguments against bevvy at the games "if you canny go 90 minutes without...." it's not the point., people can go ages without, they just want to. @Gambo thank you for your amazing efforts Saturday! Greatly appreciated! Great day had by all, at the stadium well in time and back early for an evening celebrating. Buses will run to Final, with 2 options available. Buses going to club beforehand and the others going straight to Hampden and back. Just awaiting kick off time to be confirmed then I will post details. 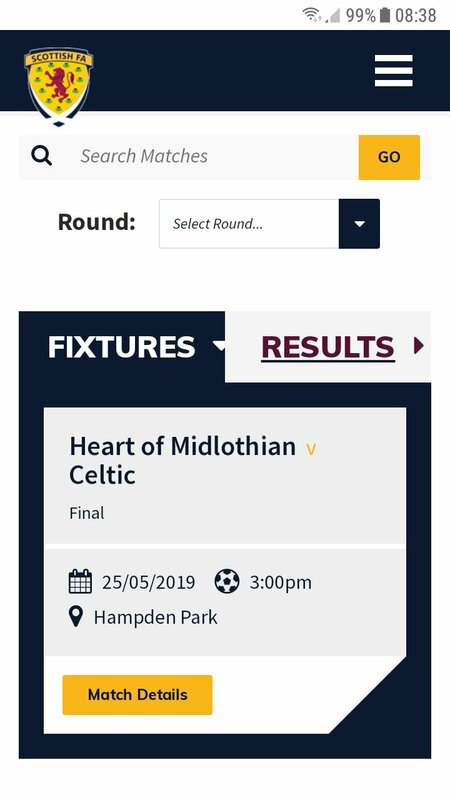 Hopefully, but sure there's been some chat it could be moved to 2pm because of the rugby final at Celtic Park. ...which I suppose could well turn out to be 6.55 on a Thursday evening in Dingwall right enough given its the SFA. Haha aye, who knows with them. I'm pretty sure it will be 3 tbh, had just read speculation they wanted to move it slightly to police the crowds.